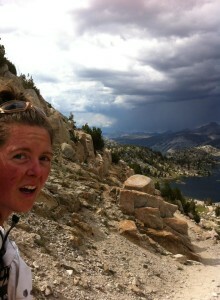 Heather “Anish” Anderson takes a self portrait on top of Glenn Pass in California. — From Heather Anderson’s trail journal, week one. 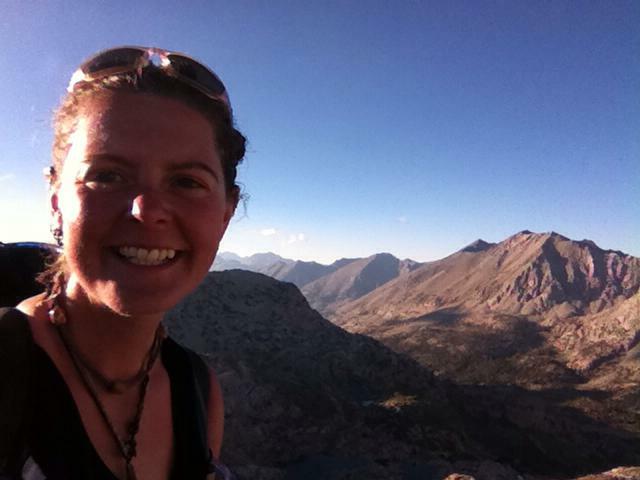 Heather Anderson, trail name “Anish,” is currently on a journey to establish a new overall speed record for the Pacific Crest Trail, a 2,655-mile mountainous route that runs the length of the Sierra Nevada and Cascade mountain ranges in California, Oregon, and Washington. The current fastest known time, established by Scott Williamson and Adam Bradley in 2009 in a similar unsupported effort, stands at 65 days, 9 hours. There is no official women’s FKT. To pursue this goal, Anish has been hiking an average of about 40 miles a day, every day. She started June 8 at the Mexican border, and after five weeks of searing heat in the Sonoran and Mojave deserts, altitude and thunderstorms in the high Sierra, and bugs and fatigue in northern California, reached the Oregon border on July 17. Personally, I find efforts such as Anish’s PCT attempt to be deeply intriguing, perhaps more so than any other human athletic endeavor. A solo through-hike is a puzzle with so many compelling layers — the solitude, the self-sufficiency, the strategy, the adaptation, the staggering distances, the necessary sustainability, the force of imagination and the unceasing willpower. Not to mention the “everywoman” aspect of those who attempt such journeys. People who aim for fastest known times on long-distance trails are rarely the genetically gifted and fine-tuned athletes who can be more difficult to relate to on a human level. No, through-hikers are often people like Heather Anderson, who hails from Washington state, who likes to eat Oreos dipped in coconut oil for dinner, and who simply “longs for a never-ending trail and everlasting lungs.” Me too, Anish. Me too. I wonder if these critics could imagine how Anish might draw deeper inspiration from her surroundings by moving through the world rather than standing still; how solitude gives her the freedom to soak everything in without distraction; how fatigue helps her shed ego and expectations so she can experience each moment with the wide-eyed awe of a child; how “pushing the envelope” of human endurance also helps individuals break through the hard plaster shells — the habits, the routines, the prejudices — that have formed around their own lives. Although people can certainly push limits without specific numbers and goals, speed records provide something of a benchmark — an idea that a far edge has been approached before, and can be approached again and possibly surpassed. It’s a common belief that people who chase “records” — whether or not they’re deemed legitimate or arbitrary — do so only for external validation. And while this is always partially true, internal motivations usually play a much greater role in endeavors that demand so much energy, take so many resources, and provide so few “rewards.” Should Anish reach Canada faster than 65 days, there will be nothing waiting for her at the border besides rocks, trees, and perhaps a close friend or two. She will receive no award besides a plain-text listing on an obscure Web forum. Gear companies won’t line up to sponsor her because the public at large has minimal understanding, and therefore minimal interest, in what it takes to grind out 40 miles a day, day after day after day. So why does Anish hike? Only Anish really knows, and I find this fascinating. 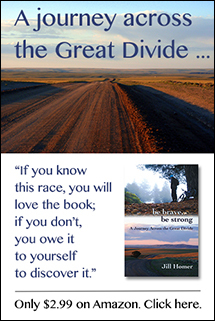 I totally agree with you Jill, she is doing an awesome endeavor and deserves our encouragement!